Anthony Crolla is targeting a second WBA lightweight title fight with Colombia's Darleys Perez following their controversial draw on Saturday. Perez retained his title despite having two points deducted for low blows, but the scoring is now set to be reviewed. Judges scored the fight 116-111 for Crolla, 114-113 for Perez and 113-113. "It was a really tough fight and there were a lot of close rounds, but I definitely thought I won," the 28-year-old told BBC Radio Manchester. "I'm yet to come across anyone, whether it be on social media or in person, who actually thought Perez had done enough for the title." 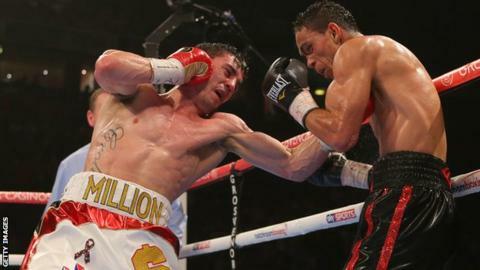 Saturday's contest saw Crolla return to the ring seven months after suffering a fractured skull and broken ankle when he was attacked trying to prevent a burglary. Having narrowly missed out on a maiden world title belt, the Mancunian is now hopeful of being handed a second opportunity in his home city. "There's an enquiry on Tuesday with the WBA, they're going to review it and hopefully they'll make a decision in the next few days," he added. "I'm hoping that they're going to order a rematch and that me and Perez will fight again and will bring him back over to Manchester."